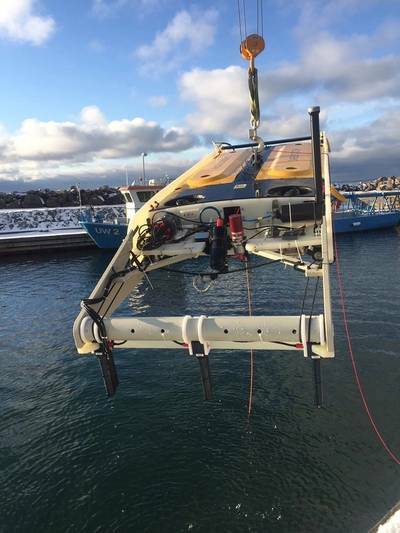 A new way to hunt down and survey buried submarine pipelines, energy cables and communication cables, comes as Innovatum teams up their Smartrak magnetic sensor system to a Saab Seaeye Sabertooth autonomous robotic vehicle. As Innovatum’s Smartrak is the smallest survey system of its type, high quality data is now available at a much lower cost. Skimming just two meters off the seabed in shallow turbulent waters - typical of installation sites - Sabertooth is the only autonomous vehicle able to handle the out-rigged Smartrak, whilst its iCON intelligent control system thinks for itself. “I’ve waited years for an autonomous robotic vehicle that can handle this kind of survey work,” says Innovatum’s chairman, Terry Slater. 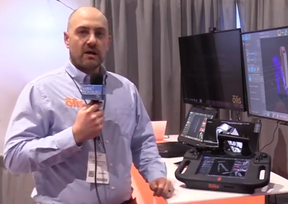 He explains how Sabertooth, with Smartrak, navigates autonomously to the target pipeline or cable, follows it, measures its position and records its depth of burial. Such data is essential for installation contractors, owners and regulatory authorities to ensure that pipelines and cables are properly buried and not in danger of being exposed to damage. “Autonomous robotics make higher standards of data gathering possible by taking human decision-making out of the loop,” Terry Slater declares, exampling how aircraft land themselves as evidence that robotics can make precise decisions. The retrieval of optimum survey sensor data is helped because all Saab Seaeye electric robotic vehicles have the advantage of presenting a low electrical and acoustic noise signature. In future, Innovatum also plans to fit their Smartsearch UXO system to the Sabertooth for hunting down unexploded ordnance. The company already operates Smartrak on three of Saab Seaeye’s remotely operated vehicle models, the Falcon, Panther and Cougar which, like the Sabertooth, can operate close inshore in strong currents and tidal flows.